Decorative slates are one of the UK’s most popular choice in decorative aggregates for a variety of gardening and landscaping projects. It’s no surprise really; Welsh slate looks beautiful and, as an offshoot of the slate crushing process, is a very environmentally-friendly option. The angular shape of slate and its hardiness make it ideal for driveways. 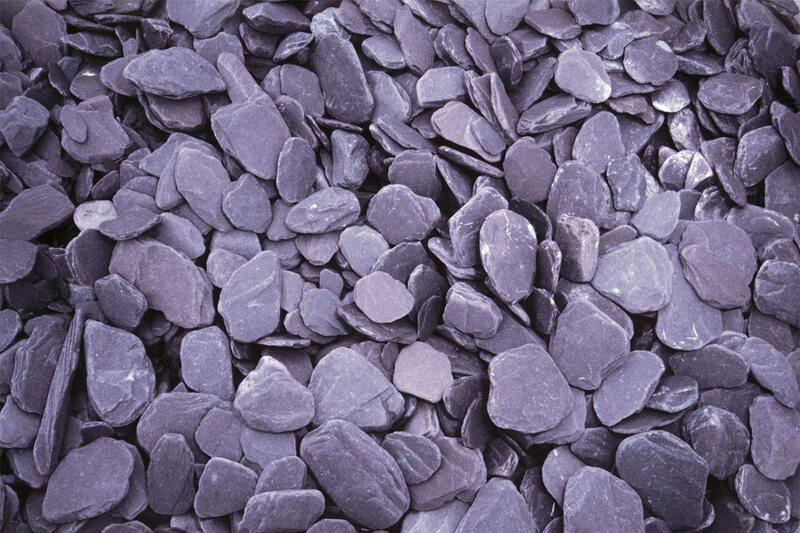 Whereas small and rounded stones may cause car wheels to rut into the gravel, slate provides excellent traction and settles down nicely. Purchasing a 20mm size decorative slate is preferable, as larger chips may flick upwards under wheel pressure and cause a safety issue. Experienced gardeners know that a high quality decorative slate adds a beautiful finish to the borders and edges of your garden. The flat shape of slate means plants will stand out and flourish without being overwhelmed by gravel. For a barely-there aesthetic that blends in with plants and foliage, green slate is a fantastic option. Black and blue slates, on the other hand, beautifully enhance greenery and vibrant flowers. No matter which shade of slate you choose, you’re sure to create an effortlessly stylish look. Garden slates look truly beautiful in water features such as ponds, troughs, and fountains. Slate is also very fish and wildlife friendly, though it will need a quick rinse before use to wash off any dust. Welsh slate is not lime-based so the safety of your fish and other wildlife is ensured. Any colour of slate will look great in water features, though different colours will create varied finishes. For a subtler look, try blue or green slate, or for a more striking finish consider plum slate or rustic gold, which looks particularly lovely in water features. Your fish will thank you! The natural colour variations in decorative slates mean they give large coverage areas a nice bit of variety so they don’t start to look dull and drab with just a single colour. It’s better to choose a chunky 40mm slate for covering large areas with ease, though the subtler 20mm size also looks great in these types of areas. Rockeries look effortlessly stylish and modern with decorative slates. By simultaneously filling in any gaps and adding stunning definition, decorative slates will enhance rockeries to create a peaceful and attractive look. Which colour you choose depends on the nature of your rockery or the rockery you are planning to create; rockeries with plants go nicely with blue and black slates, whereas plum and green slates bring in a touch of colour to complement rocks and larger stones.